Radish greens comprise of a rosette of wide, rough textured leaves that are pinnately divided with a large terminal lobe, and smaller lateral lobes, measuring about 13 cm long from the top of the root. They have a characteristic peppery, yet somewhat pungent flavor, similar to radishes. 2. Slice radishes into 1/4-inch thick pieces using a mandolineslicer or knife. Seeded bread is toasted to perfection and slathered with creamy lime-splashed avocado. The toasts are topped off with sliced radishes and sprouts to add a peppery and balancing bite. This open-faced sandwich is simple, easy to pack for lunch, and incredibly satisfying. Halve the avocado and scoop the flesh into a small bowl. Halve the lime and squeeze the juice over the avocado. Add in a pinch of sea salt, to taste. Using a fork, smash the avocado until a creamy mixture forms. Using a mandolin or sharp knife, thinly slice the radishes. 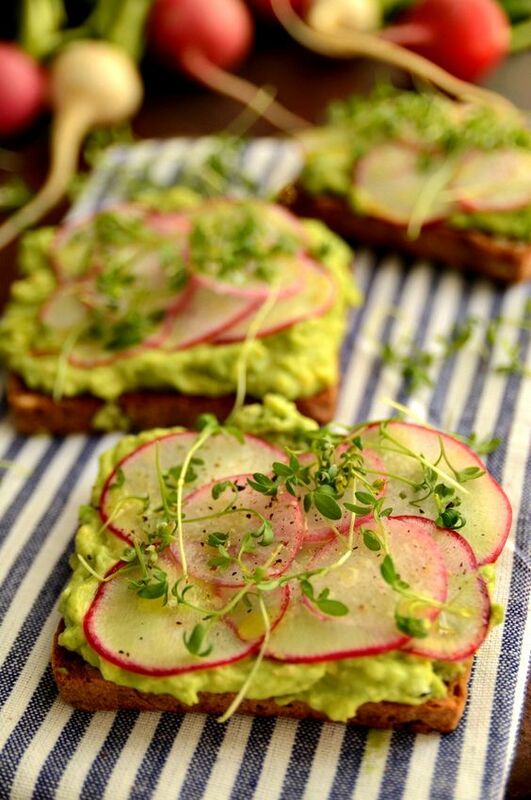 Slather each piece of toast with the smashed avocado, layer the radish slices, and sprinkle the sprouts on top. If desired, drizzle with olive oil and sprinkle with salt and pepper. * Toast walnuts at 350ºF for 8 to 10 minutes — watch closely to prevent burning. Place the toasted walnuts in a tea towel and rub together to remove papery skin. Transfer walnuts to a sieve and shake again to remove any additional skin. I know this is fussy, but it makes a difference. I have more detailed instructions here. ** I used the white and light green parts, but feel free to use as much of the dark green as you like — mine were looking a little tired at the top, so I trimmed them. Bring a large pot of water to a boil. Meanwhile, place quinoa in a fine-meshed sieve and rinse under cold water. When the water comes to a boil, add the quinoa and simmer for 9 minutes. Drain in a fine-meshed sieve and run under cold water until cool. Set aside to dry. Meanwhile, cook the edamame. This is what I did this time, but feel free to use your own method: Bring a tea kettle of water to a boil. Place edamame in a bowl. Cover with boiling water. Let stand for 2 to 3 minutes. Drain. Rinse under cold water until cool. Set aside. Meanwhile, slice up your radishes: If you have a mandoline, carefully slice each radish into thin disks. Note: if you keep the stem intact, you have a little handle to grab onto while you run the radishes down the mandoline’s plane — find a more detailed visual explanation here. Alternatively, thinly slice the radishes with a knife. Stack the circles on top of each other and slice straight down to get mini matchsticks. 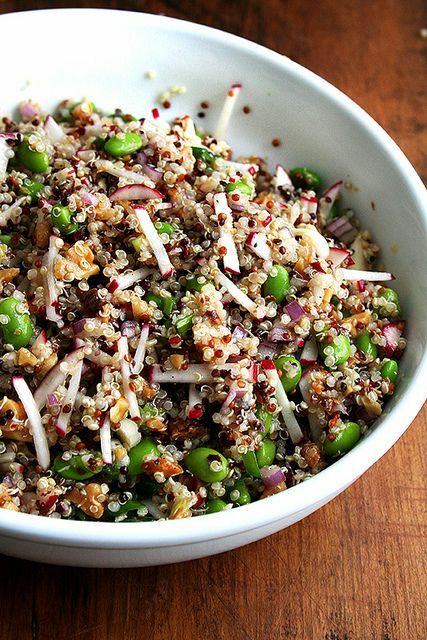 Place the drained and dried quinoa into a large mixing bowl. Season all over with salt and pepper to taste. Crush some red pepper flakes over top if you are using. Add the edamame, walnuts, red onion, scallions, radishes, olive oil and the juice of one lemon to the bowl. Toss and taste. Adjust seasoning as necessary. I added the juice of another lemon, but my lemons were on the small side. I also added more crushed red pepper flakes — I think a bit of heat is really nice in this salad.